I was just about to pull the trigger on the Monster Dog DVD when I heard the announcement that Scorpion and Kino were teaming up to release a blu-ray. So I waited and - phew! Word got to me just in time, because I would've had to double-dip for this one for sure. 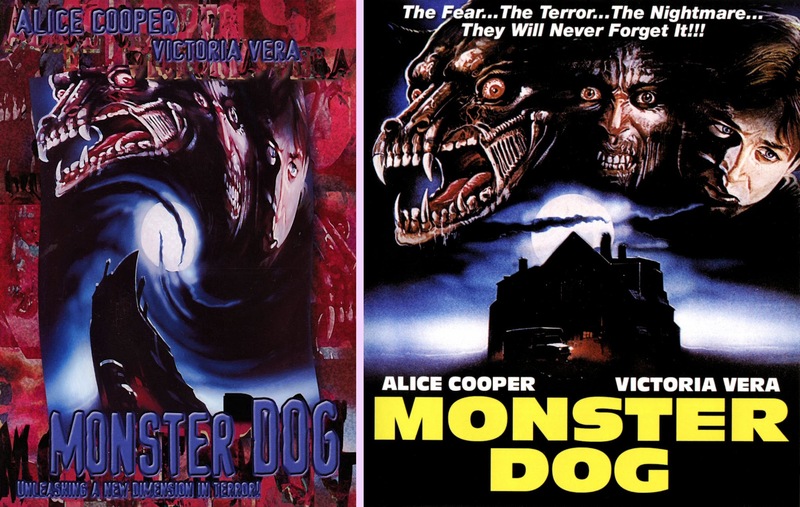 Monster Dog is one of those few remaining 80s horror titles I remember seeing the VHS cover for, but never saw the movie. So I'd finally just gotten around to giving it a shot, and it turned out to be a lot of fun! 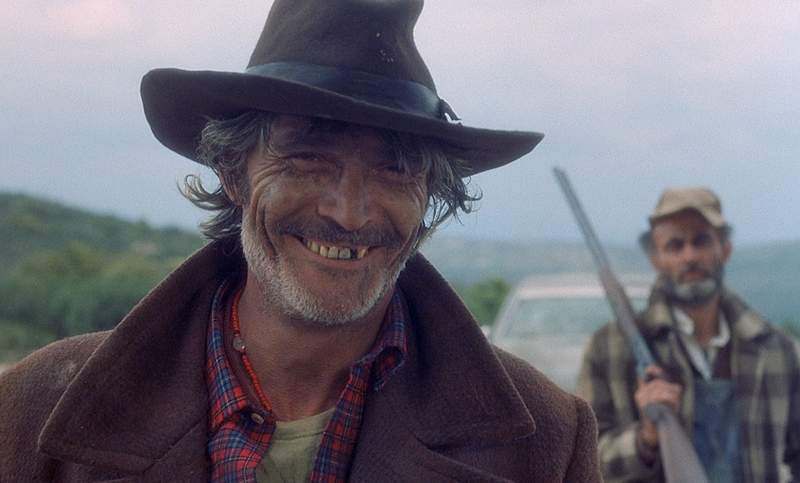 It's directed by Troll 2's Claudio Fragasso. But if you're looking for another Troll movie, this isn't it. 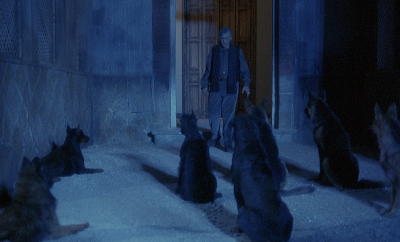 It has some silly moments, granted; but is closer in tone to Fragasso's Zombie 4 or his films with Bruno Mattei. If you something closer to the feel of Troll 2, try his Beyond Darkness, which Scream Factory recently put out. 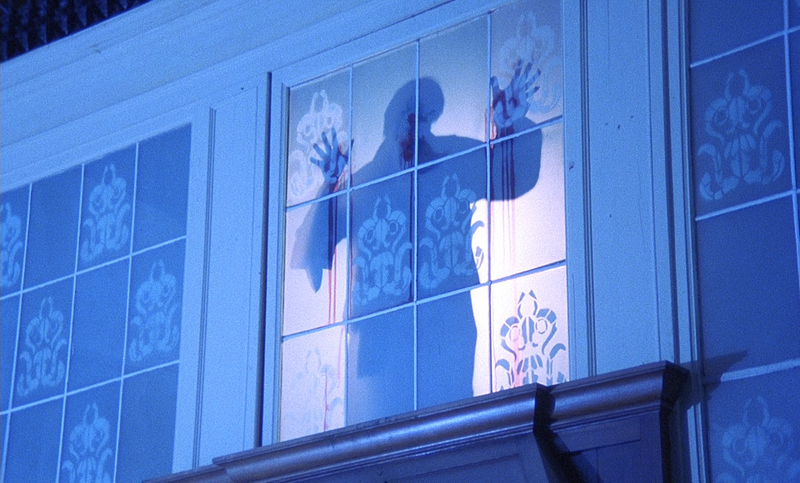 If you like 80s horror, this is 80s horror in spades. 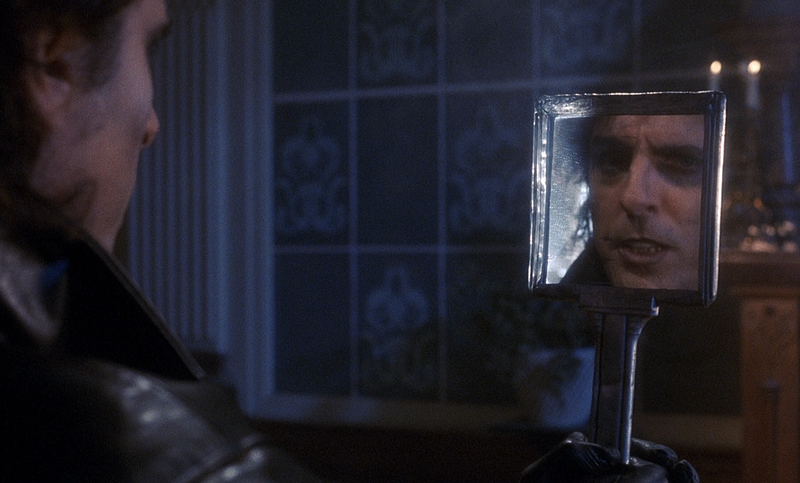 Alice Cooper(!) stars as almost himself, a rock star returning to his small hometown to film a music video. Unfortunately, he hasn't shook his old reputation, which is that he's a creepy kid somehow responsible for a bunch of monster dog killings. And wouldn't you know it? They've started up again just as he's returned. There's a pack of killer dogs, there's a literal monster dog, there's a bunch of shotgun toting rednecks looking to kill the whoever they think might be involved in the dog attacks, there's a crazy, bloody old man running around chasing girls who may or may not be a werewolf, and Alice Cooper seems to be hiding a sinister dark identity himself. Who will be the lord of the dogs? It's never a dull moment finding out. The film's bloody, has ambitious if not impressive special effects, and is really stylishly shot. 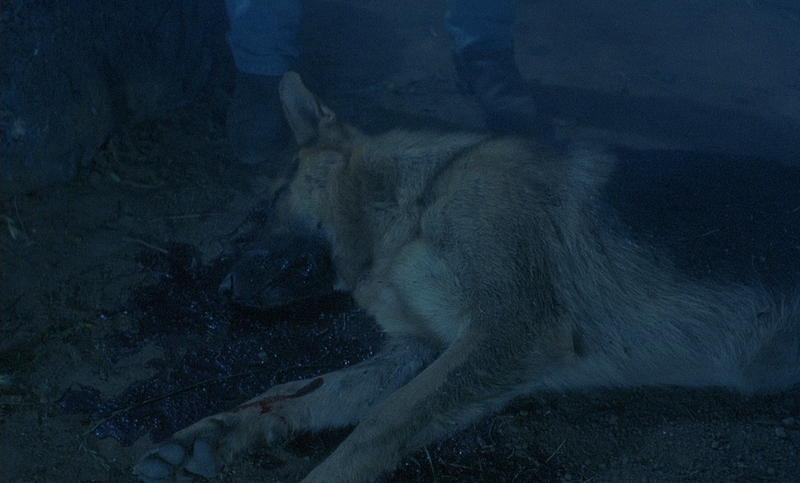 Sure, some of the dialogue's hokey, some of the killer dogs just seem happy to see the cameraman, the rock videos inserted into the film are super silly, and Cooper is unfortunately dubbed. But all that just adds to the charm. Mind you, this isn't secretly a really good film. There's a shot after a character gets killed that goes to slow-mo as it pans over the shock friends' faces and you just think, come on, man; you haven't earned any actual emotional attachment between the characters and the audience! But if you just want entertainment, Monster Dog never stops. So I've got Kino/Scorpion's brand new blu, and I've borrowed a copy of the DVD I was almost stuck with. The DVD is from 2005, put out by Substance/ Jef Films, and it's a real junker. I just have to show you their cheesy menu [right]! According to Scorpion, it's a bootleg, though it's carried by Netflix and everybody, has a registered UPC, etc; so I don't know. It's probably one of those "we'll just assume it's public domain and not license it"-type releases. But even if it is strictly legal, it might as well be a bootleg, quality-wise. Substance/ Jef's 2005 DVD on top; Kino/ Scorpion's 2016 blu bottom. About the only thing the DVD has going for it, is that it's open matte so it has extra vertical picture. But the OAR is always preferable, and the blu's 1.66:1 actually adds a little picture to the sides anyway (look at the furthest dog on the right in the second set of shots). So even that's just a bit of curiosity value. The DVD is clearly ripped from video tape and looks terrible. It's soft with little detail and bleeding colors. 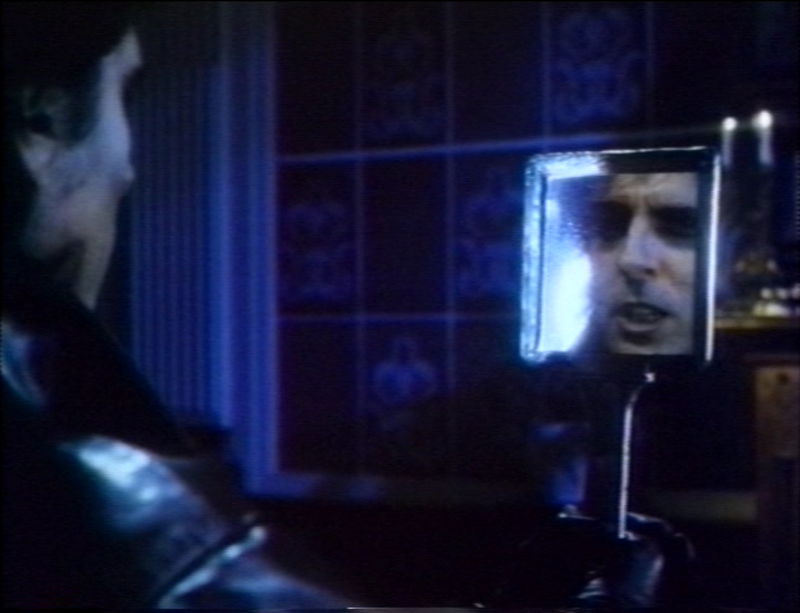 Then, to make it worse, the DVD interlaces the transfer, so you'd actually be better off watch a VHS tape. Scorpion and Kino's new blu is a revelation after living with that for all these years. Part of a shot only seen on the new blu. 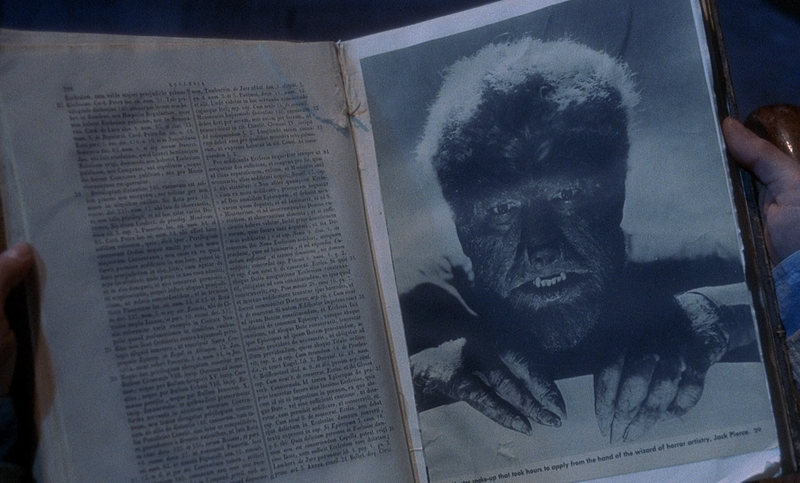 There's also some confusion about whether this is a longer uncut version of the film or not. A lot of that confusion comes from Jef Films misreporting the running time of their DVD as 81 minutes all over the place. It's actually 83.54, which is a lot closer to the blu-ray's 84:23. Plus the blu has an MGM lion logo at the beginning padding it out a few seconds further. But still, technically, this is a longer cut of the film. It has one extended shot, pictured above. At 15:47, we see the dog lying in the street before the group runs up to it. 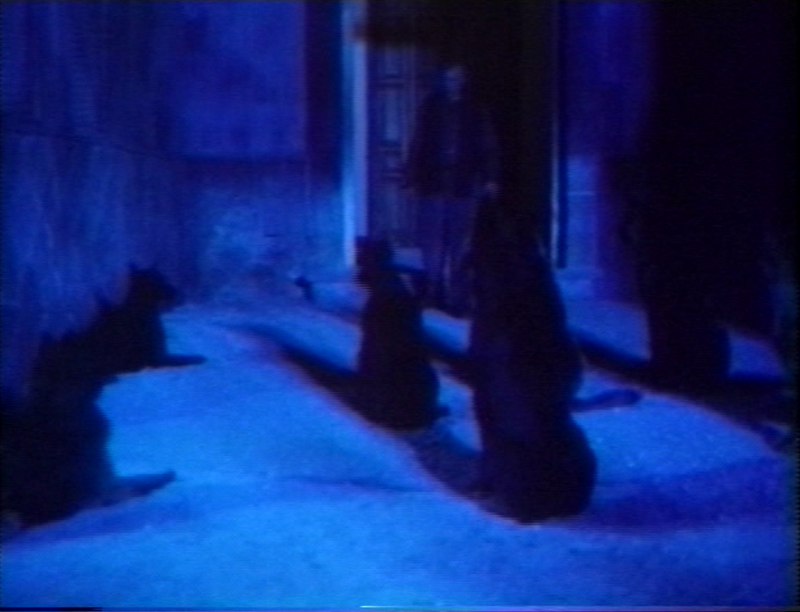 On the DVD, the shot starts with everyone around the dog. So it's a pretty minimal difference. Apart from that, both versions are the same; there are no bloodier kills or anything. But it's still nice to have that tiny bit of footage restored. And they score another win in the special features. The DVD naturally had nothing, not even a trailer. Well, except they had a collection of bonus trailers, including some from Den. You know that group Bryan Singer was involved with that was exposed in the documentary An Open Secret? Yeah, them. But the blu has some really nice stuff. First there's a fairly substantial, 43 minute featurette. 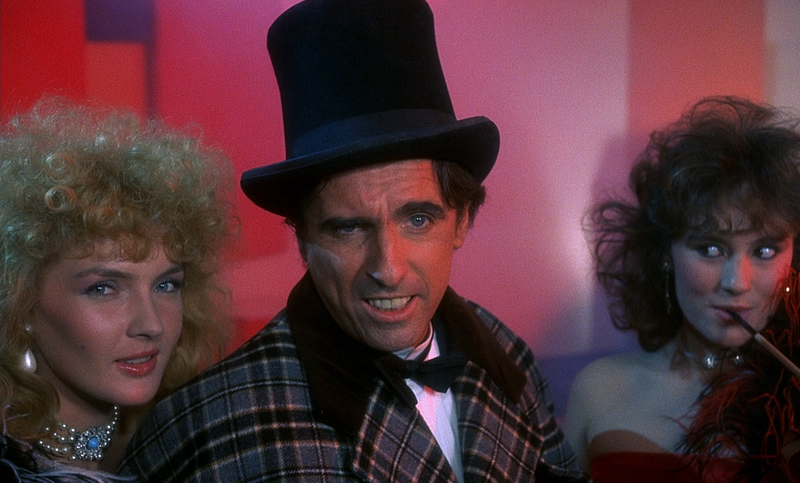 It's primarily an interview with Fragasso and a second with his wife/ screenwriter Rosella Drudi (yes, she wrote Troll 2 along with most of his other films as well), but there's also a little from producer Roberto Bessi as well. They've got a lot of good anecdotes and specific memories, so fans of the film should be pleased. 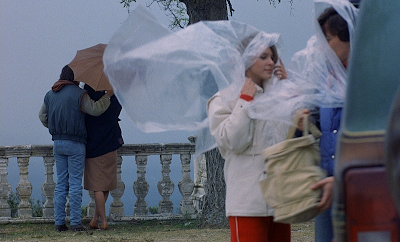 Even more exciting is the collection of about fifteen minutes worth of deleted scenes. They're from a tape, so low quality (though still better than the Substance DVD) with foreign subtitles burnt into them, but they're no less illuminating for it. Fragasso laments how the distributor cut the film after he gave it to them, and I have to say, seeing the deleted scenes, I actually think they did him a favor. The film is better how it is. But they're still fun to see as bonus scenes. There's also a neat collection of trailers, including one that's practically a music video in how it uses a complete Cooper song from the film. And there's a crazy Spanish one, too, with the alternate title Leviatan. Apparently Victoria Vera was a bigger star in Spain at the time, because they play up her involvement much more than Cooper's. There's also a stills gallery, documenting the film's past video covers and posters, and the case has reversible artwork. 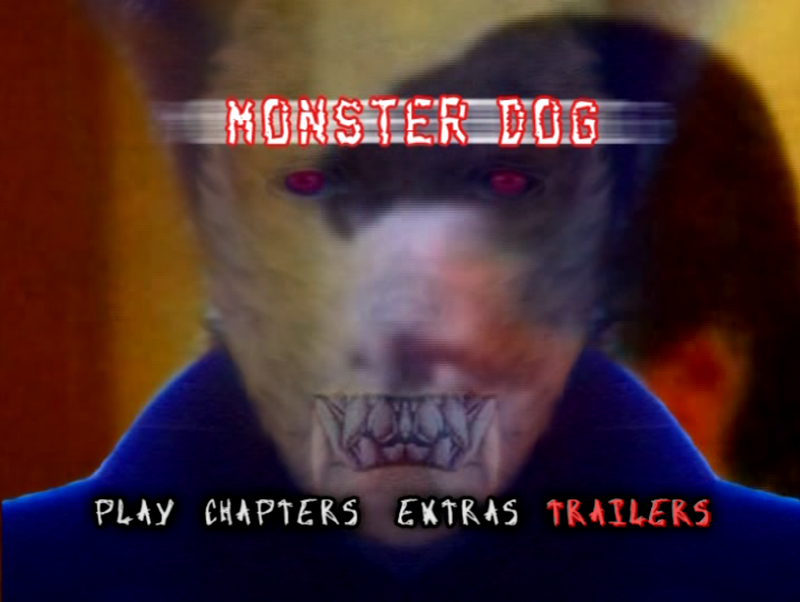 If you're a fan of Monster Dog, you're really going to be happy with this release. And if you're not, you might want to give it a second chance, because the blu reveals its qualities in a new light. The 2005 DVD was a straight dub of the 1986 VHS release. In the many, many years that I've known this movie, I never realized just how stylish it is until I saw the incredible blu-ray transfer. 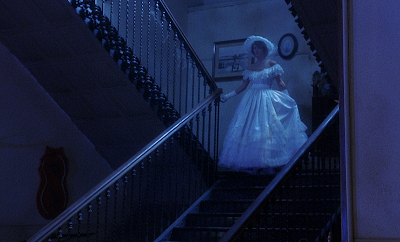 With all of the dark scenes and blown-out blue lighting, it looked downright ugly on video. In defense of Fragasso (I can't believe I just wrote that), the deleted/alternate scenes were duped from the Japanese version, which only runs 4 minutes longer than the American edit (adding more confusion, the Japanese tape ACTUALLY runs the 88 minute length that's cited on the American VHS). There's nowhere near 14 minutes of differences included in that blu-ray compilation, they lengthily bookended a lot of scenes where there was only an additional line or alternate shot. And they never should have changed the old man's final rant, his explanation in the Japanese edit made a little more sense... but this is a Fragasso film, so just a little. Awesome comparison and review, by the way.